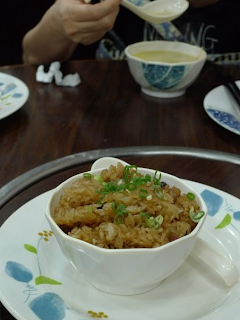 Fried sticky (glutinous) rice. Not the best nor the worst I've had, but it was very popular - they almost sold out of this too - we got the last bowl. "Jer jer" lettuce - pretty good. 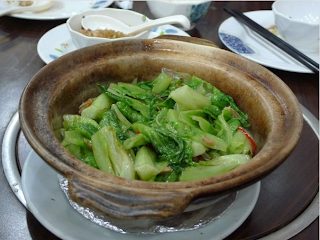 They served the semi-cooked lettuce in a separate plate, along with an empty heated claypot and some garlic and chilli. The lettuce was tipped into the claypot with the spices and quickly tossed around - aka "jer jer". They used baby lettuce too, which has a nice sweet core. Maybe a bit too much oil though. 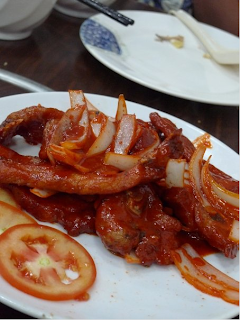 Pork chops in hawthorn sauce - a flop, as you can tell by the atrocious Chinatown rouge. The waiter had suggested we get another dish called 乾烤骨 (dry roasted ribs), but they were sold out... This was quite freshly made though so the skin was still crisp when it arrived. Unfortunately the sauce sucked. btw, that's my grandma holding the piece of frog - she held it pretty still for a full 2-3 seconds so I could take the photo - not too shabby for a soon-to-be nonagenarian! 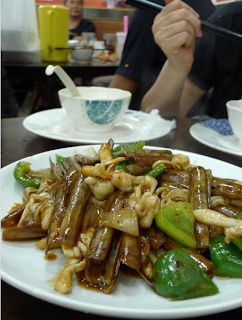 Razor clams - that's a lot for whatever they were charging (around HK$100). Meaty and pretty fresh, they were stir-fried to order - we could totally feel the 'breath of the wok', but it did take a while for them to arrive (the kitchen did several plates at once) and by then our palates had been numbed/over-stimulated by the typhoon shelter concoction, so we didn't enjoy it as much as we should have. There was one more thing they were famous for but had sold out that night - steamed chicken. 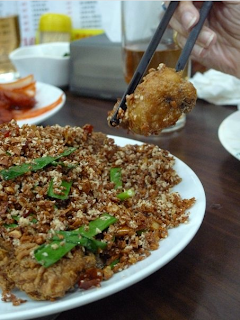 From the huge posters on the walls, it looked like a simple, no-frills steamed chook. The skin in the photo was (of course) a glorious golden yellow... mmm. 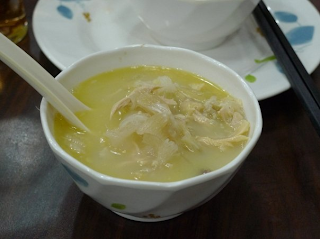 But this simple method means it all depends on the quality of the chicken - something we Cantonese are unbelievably picky about, and let me tell you, with all the bird flu scares and chilled chickens nowadays, a good chicken is hard to come by. I'll be back.